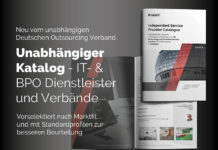 By Dr. Daniel Stock, Senior Manager, Dr. Florian Meister, Geschäftsführer at Strategic Service Consulting GmbH, Germany, Dr. Alexander Becker, Geschäftsführer PMCS.helpLine Software Gruppe and Burkhard Franz, Leiter Service Management at Lufthansa Global Business Services GmbH, Germany. 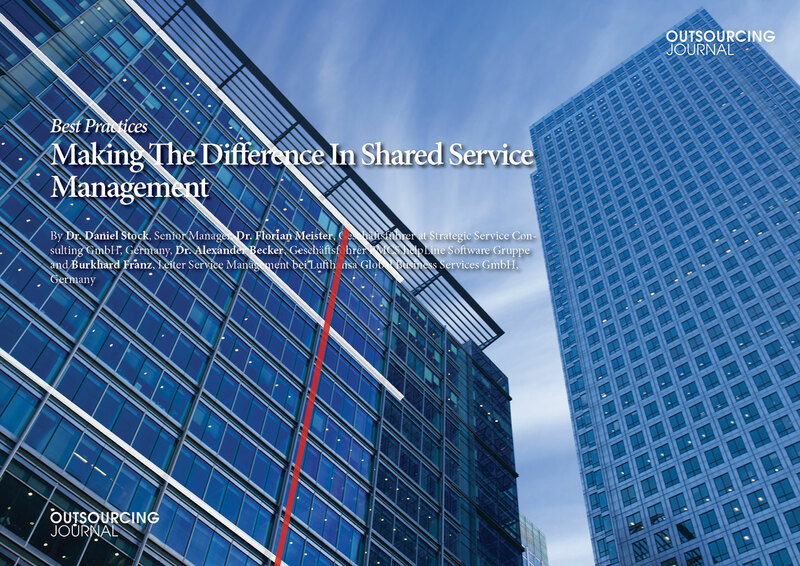 Shared service centers typically face numerous challenges in delivering the associated business cases. 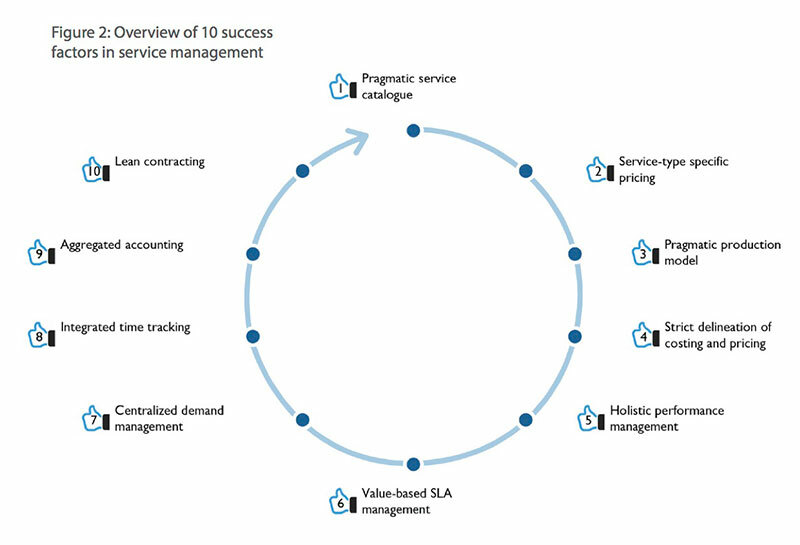 This article discusses 10 success factors towards an effective service management that realizes business value for organizations. 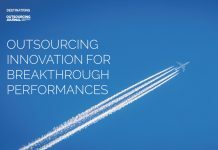 Shared services remains a priority across organizations in order to transform their operating models and benefit from global economics. This is by increasing the level of consolidation, expanding the service scope, or shifting operations from developed to emerging markets. Most organizations chose a “lift and shift” approach for this transition to either avoid the complexity of a big bang or minimize the change management efforts on the operational side. 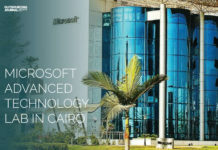 However, this approach also implies that the responsibility for the business case also transitions into the service center organizations, which are usually facing numerous challenges with this if service management is not set up and structured effectively. This article will discuss 10 success factors in service management that stem from hands-on project and day-to-day business experience. While a review along these 10 aspects provides a good overview on the current state of an organization, you need to consider organizational context to derive the right priorities going forward. The article closes with outlaying 4 likely steps for organizations in their journey towards effective service management. Service management is a complex system that spans a variety of highly interlinked processes across many stakeholders. In general, this includes firstly a sales function that owns the customer relationship and negotiates the respective service contracts (incl. pricing). Secondly, a process management function that is responsible for performance management, service level adherence and service costing. Thirdly, a finance & controlling function that issues invoices and customer/financial reports. Fourthly, operations that implements service delivery and customer care. In some cases even, a separate product management function might be reasonable in order to strengthen the customer focus in service portfolio management, however, in a captive service provider setting this might often be subsumed under the responsibilities of sales or process management. 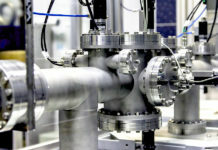 Figure 1 provides an overview of this generic set-up. Although the specific set-up might differ this illustrates the level of dependencies that require attention to ensure an end-to-end consistent and effective service management approach. From our experience, a service organization needs to address the following 10 success factors in order to effectively mitigate the risks arising from these dependencies (see Figure 2). 1. Pragmatic service catalogue as single frame of reference for all stakeholders. This is the basis to ensure consistency across all processes outlined in Figure 1. Nevertheless, defining a service catalogue means effort that needs to be tailored to organizational context. For example, for a captive service provider both number of services and level of service specification should be limited to the bare minimum. However, in case of a shared service center that also addresses external customers and/or is competing with external providers this might be completely different in order to provide the requested transparency as well as flexibility to adapt to individual customer needs. 2. Service-type specific pricing to set the right incentives in demand management and balance associated Controlling efforts. For example, infrastructure services (singular in occurrence and homogenous in specification) should be priced as lump sums since the service cost would usually not be able to adapt to changes in the demand structure easily. 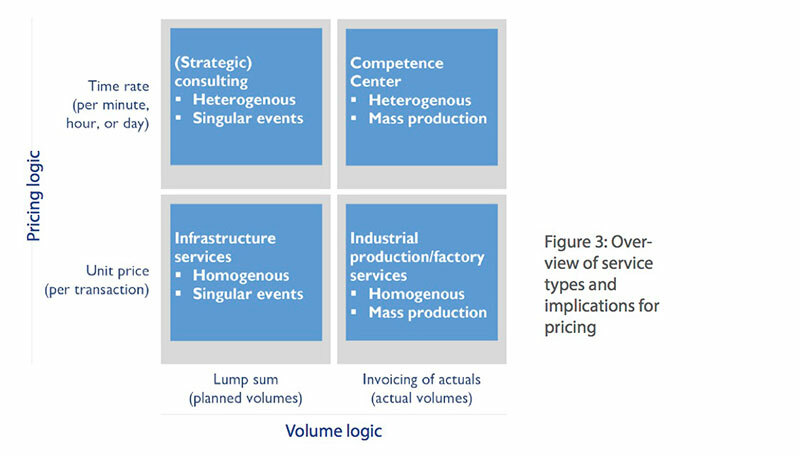 Transactional pricing based on actual volumes should be chosen for mass services where the service cost scales with the demand of customers (see Figure 3 below). In addition, the decision for lump sum versus transactional pricing should also consider risk mitigation aspects. Whereas lump sums might cause adverse behavior on the customer side, transactional pricing sets clear incentives for thorough demand management. However, transaction pricing implies additional controlling efforts that need to be compensated for. Therefore, it makes sense to limit transactional pricing to the most important services and charge the remaining services in form of a capitation fee. In general, a capitation fee can be structured in 4 parts (see Figure 4 at the next page). Firstly, a provisioning fee for (quasi) fix costs that incur for setting up the service facilities. Secondly, a base fee for services with deterministic demand (e.g., each employee requires one payroll service per month). Thirdly, an insurance fee for services that are beyond the customers control and therefore do not lead to adverse behavior (e.g., a customer cannot control the number of maternity or parental leaves). Fourthly, a flat fee for services with a low risk profile due to insignificant volumes or low marginal cost. 3. 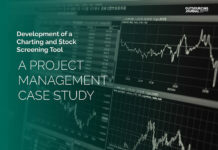 Pragmatic production model as a basis for performance management and costing. A production model identifies which resources are required to produce a service and to what extent. This includes in particular documenting activity-based personnel efforts as well as usage of IT products. A production model should be designed in a pragmatic fashion, revealing the key complexity and effort drivers as a basis for costing. For example, an invoice control service gets complex in case the automated matching between received and expected invoice fails. A good production model would identify the ratio of failing vs. non-failing invoice controls as well as the associated efforts for both variants. Dependent on the organizational context, the complexity driver (failing vs. non-failing in above example) can also be applied in a differentiated pricing approach to incentivize the customers to control invoice data quality. 4. Strict delineation of costing and pricing as a basis for an effective steering logic within the service organization. Costing and pricing needs to be consistent with the desired profit and cost center structure of an organization. If prices are not assigned on service-level exclusively this will dilute any financial performance analysis. 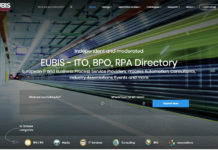 The only exception is when you cross the boundaries of the service organization and source pre-services from (independent) internal or external service providers. 5. Holistic performance management to integrate strategic targets and customer concerns in prioritization of process management efforts. Performance management needs to look beyond financial performance alone and, therefore, should be structured along at least 4 dimensions. Firstly, strategic fit to evaluate services against the target service model. Secondly, financial performance to monitor volumes, cost as well as contribution. Thirdly, service level adherence to monitor compliance with the contracts. Fourthly, customer satisfaction to include the perspective from outside of the service organization (e.g. in form of NPS or NVS scores). In combination with ranking services by significance this should be applied in prioritizing the improvement efforts of operational controlling, performance management, and operations. 6. Value-based service level management to maximize benefits end-to-end. 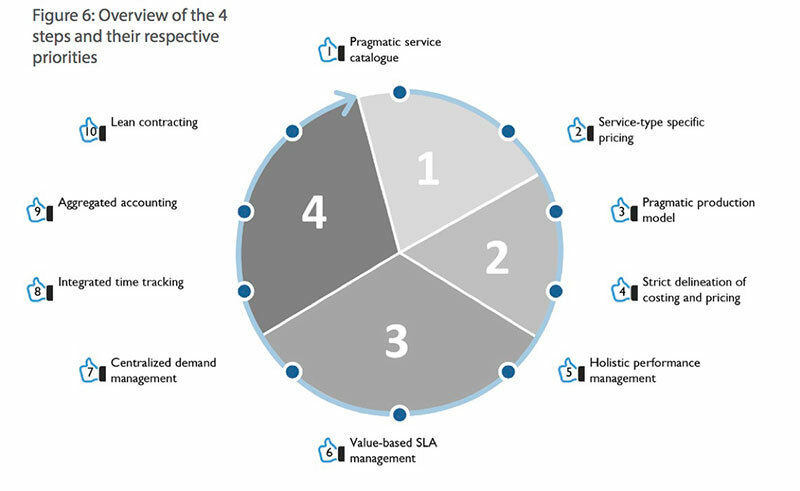 Value-based SLA management integrates the perspectives of the customer and of the service organization by jointly evaluating the business value against the implications on service cost. This requires on the service organization’s side the outlining of incremental cost / savings for changes in service levels and on the customer’s side (e.g. for different levels of system availability) evaluating the impact on business value (e.g. from financial implications of delays in processing times). Ideally, the retained organization plays a connecting role in these discussions to ensure that business and service organization meet at eye level. 7. Centralized demand management to optimize service delivery on corporate scale. This is mostly a concern for internal service providers that see themselves confronted with the individual requirements of numerous customers, which makes it difficult for them to deliver against their standardization and harmonization mandate. In many cases, product management will not be empowered sufficiently to force meaningful changes into the organization nor will it be close enough to the business to consider or validate potential business impact. 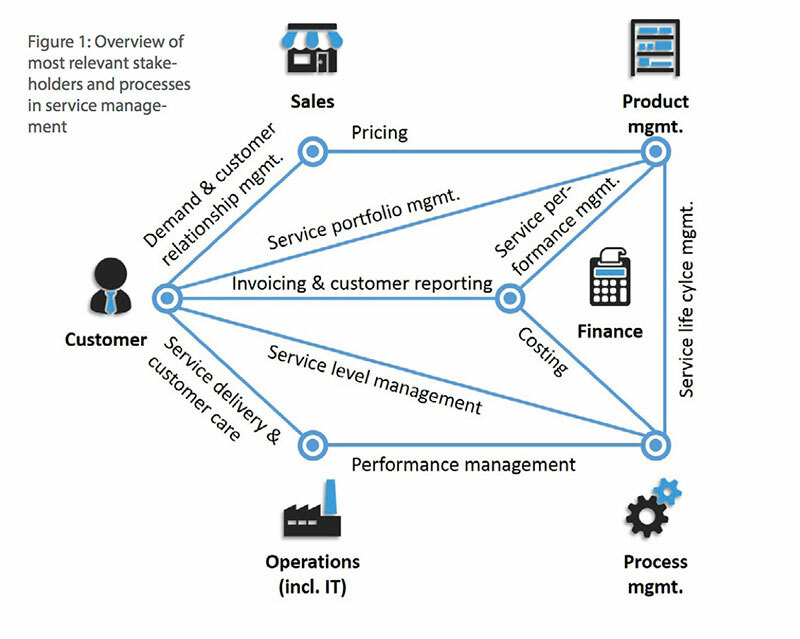 Therefore, it is useful to centralize demand management on the business side (structured along the main functions or processes) in order to drive discussions towards a global (corporate) not local (single customer) maximum. However, there is one exception if the internal service provider takes on responsibilities that are a clear differentiating factor for their customers (in form of a center of excellence). In this case, it can be reasonable to keep demand management local. 8. Integrated time tracking to ensure that this data can be used to advance production model and costing. The time tracking structure for employees should be consistent with the production model of services to provide the basis for plan vs. as-is comparisons in specified efforts per unit. Ideally, the time tracking tool is directly integrated into the service management solution hosting the production model so that costing is adapted automatically. Alternatively, time spend analyses need to be applied on a regular basis to ensure that the costing logic is cause-fair and the specified efforts constitute a valid checks-and-balances for resource planning. 9. Aggregated accounting to not duplicate the invoicing granularity in the ledgers. Invoice control requires a detailed listing of services consumed with at least individual prices and/or volumes. However, this granularity should not drive the accounting granularity to the same level. Firstly, the monitoring of a cost unit will suffer from this high number of usually unstructured line items. Secondly, accounting is strictly controlled so that in case of errors the administrative effort will increase with the number of lines affected. Therefore, accounting should be conducted on an aggregated level while the invoice provides all the necessary detailed information. 10. Lean contracting building on service profiles in the service catalogue. 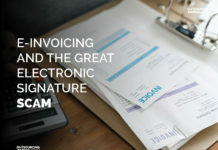 The contract scope should be reduced by signing a frame contract – often already available on corporate level – (signed once) with all general terms and limiting the statement of work (signed yearly) to only customer specific elements like what services are ordered, in what quantity and at which price. Service descriptions, SLAs, and contact information (which are usually customer independent) should be referenced, ideally, as an online compendium of service profiles. In case, customer specific deviations in service provisioning need to be documented, this should be structured as incremental addendum (see Figure 5). Final tip: including a service center mandate in the frame contract will strengthen the position of the service organization in driving standardization and customer spanning improvements. While some of these issues are either a question of the right tool support or a conceptual / change management challenge, in most cases it is a combination of both. However, in the light of an iterative approach in advancing a service management organization both starting points are viable as long as they are discussed in the context of a clear roadmap towards an agreed target state. In practice, service organizations usually show improvement potential in at least some of the 10 aspects discussed in the previous chapter. However, whether this improvement potential is a priority depends on the predominant issue in its service management approach. In the following, we introduce four likely steps towards effective service management and which success factors to focus on (see Figure 6). Newly founded service organizations as well as service organizations significantly extending its service scope often get stuck when inheriting customer specific service catalogues that show different levels of granularity and specification. Instead of defining clear standard services and setting clear incentives in the pricing scheme for reducing deviations, service organizations avoid forcing change on their customer organizations (esp. in the light of the usual dips in service quality in the first months after the transition). This significantly impedes the ability of the service organization to drive its harmonization mandate. 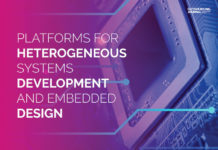 The priority in this case is to start with defining a pragmatic service catalogue integrating all the different service catalogues into a customer independent and well-structured service portfolio that is linked to the underlying process model. This should be followed by defining service-type specific pricing that identifies additional cost for deviations from the standard service offering as well as focuses transactional pricing on the most relevant services (usually 10-20% of the services in the portfolio will cause 80% of the cost in the service organization). This will result in a clear roadmap for driving harmonization and incentivizing demand management across customers. Chubak, Kaplan, Kelly (2011) outlines that this can yield in up to 5-10% cost savings by discussing storage services in detail. In the end the controlling function needs to ensure that accounts reconcile. However, if this mandate is viewed as the primary goal instead of an essential condition, this can lead to financial reports that do not support value based management. Worst case, product as well as process management builds up a kind of shadow accounting since controlling does not provide what is required. However, this is suboptimal from a center management’s standpoint since it limits its steering ability. The priority in this case is to establish full cost transparency for service delivery and build up a pragmatic production model to ensure costing is structured cause-fairly along the most relevant complexities and effort-drivers. In addition, a strict delineation of costing and pricing needs to be implemented to provide meaningful financial transparency that can drill-down to service-level for identifying the root-causes in deviations from plan. Typically this will help reveal that 5-20% of all services currently show a negative contribution and provides the basis for center management to set the right incentives. Process management often rather acts as a SWAT team on call than a strategic facility that actively shapes the target operating model and drives the roadmap in the form of a set of clearly prioritized measures. While there are no objections to having a limited amount of SWAT activities, these usually stem from customer complaints that are rather shortsighted when it comes to prioritization of scarce resources. The priority in this case is establishing a holistic performance management approach that provides transparency across strategic fit, financial performance, service level adherence and customer satisfaction. Customer satisfaction will act as a counterbalance to service level adherence, which is usually reported green. Although customer satisfaction is an emotional dimension that exaggerates negative aspects, the service organization needs to ensure that the spread to service level adherence does not get too big. This should also be the basis to drive value-based SLA management jointly with customers to ensure that business value on the one hand as well as service cost on the other are proportionate. Ideally, these discussions are facilitated by centralized demand management, which ensures that discussions target a global maximum on corporate level. How powerful this is shows an example of increasing availability of IT applications, which had been requested by business. 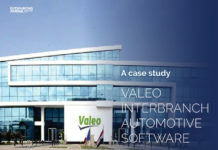 However, an end-to-end analysis revealed that increasing the ERP availability from 98 to 99% would have caused 3 million EUR in incremental service cost, while the unavailability of the system would only imply business cost of around 150 thousand EUR. Media breaks are causing several issues and usually require extra efforts for ensuring consistency. This usually becomes most apparent during the budgeting process that can paralyze an entire service organization for several months. This means ensuring that the ERP systems are in sync with the budgeting information distributed/discussed with the customer, aligning contracts with the most current version of the service catalogue (or corporate policies), and updating costing parameters in line with insights from performance management. The priority in this case on the one hand is to introduce decoupling concepts like lean contracting or aggregated accounting that will help to reduce dependencies to a minimum. On the other hand appropriate tool support should be considered that supports service management end-to-end and will provide the basis for integrated time tracking for up-to-date costing parameters as well as automation potential of the points mentioned before. Choosing an adequate service management tool that supports processes end-to-end (opposed to standard ERP functionality) can free up approximately 2 FTE per year by reducing manual efforts in reporting, cost allocation, billing, production model maintenance, budgeting, and data uploads. While these cases are not comprehensive, they demonstrate that usually only a fraction of the 10 success factors is relevant at a time. Nevertheless, a fraction will be enough for making significant progress. 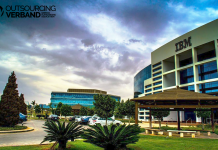 In many cases, this journey also provides the potential to involve the customer organizations. At the end, they benefit in the same way and are supportive even at the expense of certain changes to processes and behavior that they have come to love. 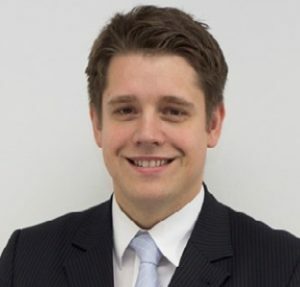 The authors: Dr. Daniel Stock ist seit 2014 Senior Manager bei der Strategic Service Consulting. 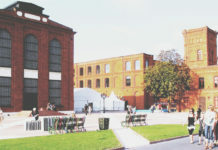 Der Wirtschaftsingenieur stieg 2006 nach seinem Studium an der Universität Karlsruhe in der Top-Management Beratung McKinsey & Company ein. 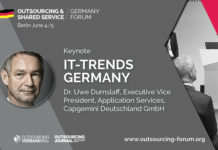 Dort arbeitete er als Teil des Business Technology Office (BTO) vorwiegend an der Strukturierung und Unterstützung von Business und IT-Transformationen für international agierende Unternehmen. Im Rahmen einer Freistellung hat er am Institut für Wirtschaftsinformatik der Universität St. Gallen im Themenkomplex Unternehmenssteuerungssysteme promoviert. 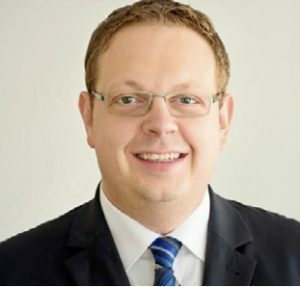 Dr. Florian Meister ist seit 2012 Geschäftsführer der Strategic Service Consulting GmbH. Der Wirtschaftsinformatiker hat während seines Studiums an der Westfälischen Wilhelms-Universität Münster zunächst u. a. bei IBM und Steria Mummert Consulting intensive Erfahrungen mit Software-Entwicklung für internationale Unternehmen gesammelt. Nach Abschluss des Studiums stieg Meister 2001 bei der Strategie-Beratung Corporate Transformation Group (CTG) ein. 2007 wechselte er zur Top-Management-Beratung A.T. Kearney, bei der er als Mitglied der erweiterten Geschäftsführung Großprojekte an der Schnittstelle zwischen IT und Business verantwortete. Dr. Alexander Becker verantwortet als Geschäftsführer in der Unternehmensgruppe PMCS.helpLine die Gesamtstrategie sowie die Integration von in- und ausländischen Tochterunternehmen. 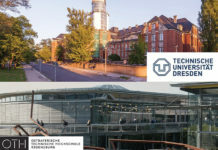 Er studierte in Karlsruhe Wirtschaftsingenieurwesen mit Schwerpunkt Informatik und promovierte in Darmstadt über Wirtschaftlichkeitsfragen von IT-Architekturen. 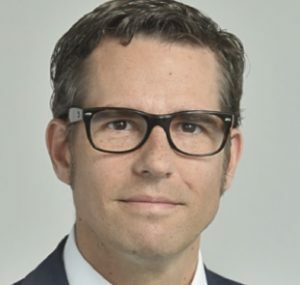 Dr. Becker verfügt aufgrund seiner früheren Tätigkeit als Projektleiter im Business Technology Office von McKinsey & Company über langjährige Erfahrung in der Top-Management-Beratung. Burkhard Franz ist seit 2001 bei Lufthansa in verschiedenen Positionen tätig und leitet seit Anfang 2014 die Abteilung Service Management bei Lufthansa Global Business Services GmbH. 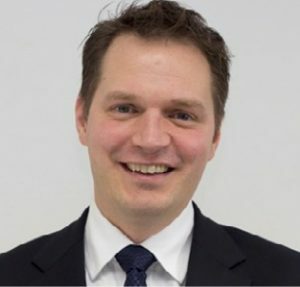 Nach dem Studium der Außenwirtschaft an der FH-Reutlingen und einem anschließenden MBA an der SLU in Louisiana USA, ist er als IT-Berater bei der Lufthansa Systems in Hamburg eingestiegen. 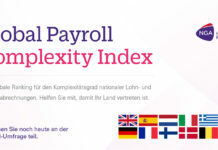 Nach mehrjähriger Tätigkeit in internationalen IT-Projekten hat er die Produkt- und Vertriebsleitung für eine SAP-Software zur Erlöse- und Leistungsabrechnung übernommen. Später wechselte er zur Lufthansa Revenue Services GmbH, um dort den Bereich Business Development aufzubauen und shared-servicefähige Prozessleistungen im Umfeld der Erlös- und Leistungsrechnung für die Lufthansa Gruppe zu etablieren.